OCHOPEE, Fla.— Twenty-two-year-old intern Alyssa Parker Geisman never planned on living in Big Cypress National Preserve after her graduation from college in May 2007. In fact, the Boston native wasn’t too sure about the future at all. After studying geology at the University of Miami, though, she did have a few ideas of what she wanted. Alyssa Parker-Geisman has been interning for Big Cypress National Preserve since mid-October (Courtesy of Big Cypress National Preserve Outreach and Education Office). Led by her love of volunteering and the outdoors, Parker searched online for something to do after school ended in May. Her online hunt matched her with an internship opening at Big Cypress and an interview with Lisa Andrews, Administrator of the Interpretation division. The two got along well and a few months later, in mid-October, Parker finished unpacking in her new home at Big Cypress. As an intern, she lives in an on site house, sharing it with other employees and volunteers. It takes only a few minutes to walk from her house to the office at the Oasis Visitor Center, which is where Parker’s typical day starts. At her desk, she’ll spend a few hours doing paper work, answering visitor’s questions and working on projects. The type of projects she does varies depending on the time of year. At this time, she is working on a domino habitat game for the teacher pack, an educational tool BCNP sends out to teachers in the area. The pack teaches about the environment by using interactive examples from Big Cypress. The domino habitat game will hopefully convey the delicate balance of life at the preserve. 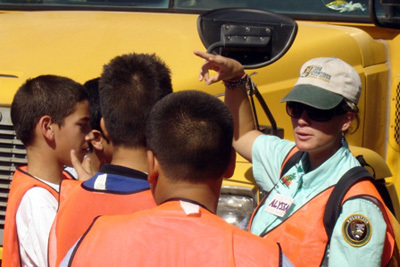 A swamp walking group receives a safety talk (Photo courtesy of Big Cypress National Preserve Outreach and Education Office). Zipping on U.S. 41 and Alligator Alley, many people may have glanced out their window at Big Cypress, but haven’t really seen the five different habitats it has to offer. Unlike other national parks in Florida, the Big Cypress landscape changes very quickly by climbing a few inches or feet above or below ground. This constant change in the surroundings depending on where a person is standing is what makes Big Cypress truly unique. Big Cypress’s five habitats (waterways, hardwood, prairie, Cypress swamp, and mango estuary) may not get much publicity, but make this national preserve a “definite hidden jewel of South Florida,” according to Parker. After spending some time at the Visitor Center in the morning, the intern goes out and about to the swamp—her favorite part of the day. Sometimes she takes Boy Scouts or other small groups of people on wet-walks on the Florida Trail. After meeting the group at the Visitor Center, and giving the scouts a pre-site briefing, they cross U.S. 41 and walk through the prairie. This then merges into the Cypress Dome, which contains an alligator hole that holds much of the preserve’s water. During the whole walk, Parker points out different species of plants and animals, something she learned after living at Big Cypress for a couple months. Once they walk halfway through the dome, the group of adventurers turns back toward the prairie and makes a full circle to return to the Visitor Center. 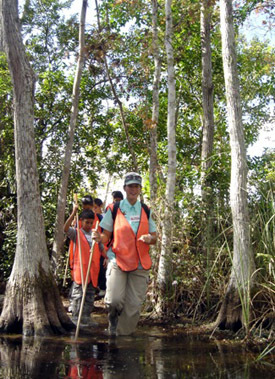 Alyssa and her group enter the swamp using long wooden poles for balance and safety (Courtesy of Big Cypress National Preserve Outreach and Education Office). Location: U.S. 41, half way between Miami and Naples. Hours of Operation: 8:30 to 4:30 p.m. daily; closed Dec. 25. 31 miles of the Florida Trail is located on Big Cypress terrain. All Ranger led activities are free. call 239-695-1201 or visit http://www.nps.gov/bicy/pphtml/activities.html.